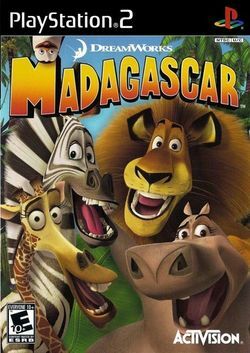 Madagascar is a game for the PlayStation 2, Nintendo DS, GameCube, Xbox and Windows, where the four main characters are lost on the island of Madagascar, Africa. Your goal is to get them back to New York. On arrival of the island you will befriend some lemurs who you must also help by getting rid of their enemy, the foosa, who often attack the lumurs. In some of the levels you must play a fixed character, whereas in others you can switch between them by using a totem pole. This page was last edited on 18 December 2008, at 22:26.